This week we celebrate Earth Day 2006. But today we are going to take a journey, a voyage starting way back before we were born, or even before humans first appeared on Earth. This journey starts at the original Earth Day, Earth Day 4.6 billion BC. Before this time, the solar system was just a massive cloud of gas – mostly Hydrogen and Helium, but with some elements that we see around us every day - like metals - and some necessary for human life - like oxygen. This cloud started to condense, perhaps because the explosion of a nearby star in a supernova caused a shockwave that started the collapse. As gravity pulled all the molecules in the cloud closer and closer together, collisions between the molecules became more frequent, and so the cloud became hotter and hotter. In the centre of the cloud, it was so hot that the sun began to form. Further out from the centre, the gases started to cool down, and dust and ice started to freeze out into solids. These solids occasionally ran into each other, and stuck together. As the objects got bigger and bigger, more debris was able to stick to them. Eventually these objects got big enough that they started attracting each other through gravity – these rocky objects are called planetesimals. One of these planetesimals, about 150 million kilometres from the sun, became the Earth. Another of these smashed into the Earth, tilting it on its side and perhaps creating the Earth’s tectonic plates. This one became the Moon. The infant Earth was very different from the Earth of today. There were no oceans, and most of the atmosphere was blown off by the solar wind from the infant sun. It was smashed by debris still around from the formation of the solar system, and was so hot that it was fully molten. Heavy elements sank to the centre of this super hot liquid ball, while light elements rose to the surface. 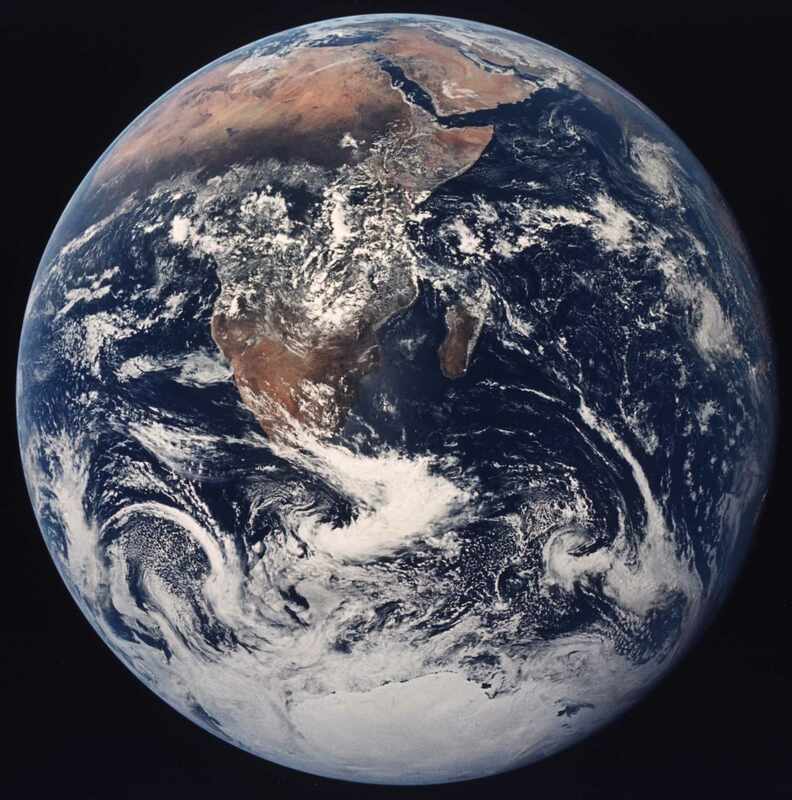 On Earth Day 4.4 billion BC, the Earth’s surface finally cooled enough to form a solid crust, and as this cooling continued, the separation of heavy and light elements caused the Earth’s layers that we see today. Around Earth Day 4 billion BC, the Earth was in a period of heavy asteroidal bombardment. This caused steam to be released from the crust, and intense volcanic activity released more and more gases, giving rise to an atmosphere. Asteroids also brought water to the Earth in the form of ice, which was quickly evaporated into water vapour. Now clouds could form. The Earth continued to cool, and eventually it rained. It rained so hard and so often that the oceans were formed on about Earth Day 3.8 billion BC. The Earth’s atmosphere at this stage probably contained mainly ammonia, methane, water vapour, carbon dioxide, and nitrogen. There was very little oxygen, but this is when it is thought that life started to begin. Some scientists think that the energy from volcanoes, lightning and ultraviolet radiation – as there was yet no ozone layer – drove chemical reactions that produced complex molecules from simple abundant compounds such as methane and ammonia. All this continued for a very long time, until by chance there arose a new molecule, a molecule that had the ability to replicate itself. Eventually, and scientists are not yet sure how, DNA was formed. DNA is the replicator that is the basis of all known life, except for a couple of viruses. Lets skip about one billion years ahead to Earth Day 3 billion BC. At this time, photosynthesis in some primitive life started to occur. We see photosynthesis around us all the time – it is what plants do to convert the sun’s energy into energy it can use to grow. This primitive photosynthesis converted the carbon dioxide in the atmosphere into oxygen. At first, this new oxygen was bound up by minerals on the Earth’s surface. But eventually the minerals could not take up any more, and oxygen started to accumulate in the atmosphere. Some of this oxygen formed ozone that blocked the sun’s ultraviolet rays, which although probably helped to start life, was making life difficult on the surface as it made cells mutate too quickly. Lets skip a couple of billion years ahead. We’ve now got an atmosphere with plenty of oxygen in it. We’ve got harmful UV light being blocked. At Earth Day 700 million BC, plants are colonising the water’s edge of the supercontinent Gondwana, which was made up of the Earth’s modern southern hemisphere countries. On Earth Day 450 million BC, animals crawled out of the oceans onto the land and ate the plant life, which by this stage had made a happy home on the land. These animals got bigger and bigger, and on Earth Day 230 million BC, dinosaurs appeared. They dominated the Earth for some 150 millions years until they were finally wiped out in a catastrophic extinction, possibly caused by an asteroid impact. It is thought that on Earth Day 6 million BC – or if the history of the Earth was condensed into a single day, then at 2 minutes to midnight – apes started to walk upright. Soon after, the first human-like species evolved, and on Earth Day 200,000 BC, or 2 seconds to midnight, Homo Sapiens arrived. 10 thousand years ago there were 5 million humans on Earth, now there are 6.5 billion. We are still learning about past human civilisations, and still uncovering artifacts from ancient Rome and China.